Have you ever imagined speeding your WordPress website by implementing a Content Delivery Network (CDN)? This tutorial illustrates how the CDN configuration usingÂ Â Amazon CloudFront and Rackspace Cloud Files (with Akamai CDN) speeds up the WordPress website. Before going forward, if you are not aware about CDN,Â thenÂ this articleÂ will provide a quick glance around CDN fairy tales. Minify: Check â€œEnableâ€�, and select â€œManualâ€� as minify mode. CDN: Check â€œEnableâ€�, and set the CDN Type to Self-hosted for now (weâ€™ll change this to Amazon/Rackspace later on). General: Enable â€œRewrite URL structureâ€�. HTML & XML: Enable â€œHTML minify settingsâ€�. JS: Enable â€œJS minify settingsâ€�, check the boxes as shown in the screenshot, and add your .JS files (you can find these by searching for them in your source code of your front-end). Use only the template files, no Adsense or Analytics code or something like that. Use â€œBlockingâ€� in the embed location drop-down if the script is needed to load the page, otherwise use â€œNon-Blockingâ€�. CSS: Enable â€œCSS minify settingsâ€�, and again check the boxes as shown in the screenshot. Add your CSS files (which you can find the same way as the .JS files). General: Check all the box from â€œHost attachmentsâ€� to â€œImport external media library attachmentsâ€� to have full control over content. 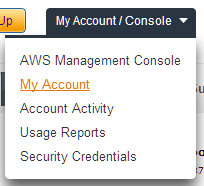 Configuration: Leave these unattended for now, this is where you will fill in your Amazon or Rackspace details. Advanced:Check the first three boxes, and the last one Set cookie domain to â€œdomainname.comâ€�. Save all settings. You will see some red and yellow messages on top of your W3 Total Cache settings screen. We will deal with these later, because first you need to setup up Amazon CloudFront or Rackspace Cloud Files as your CDN. 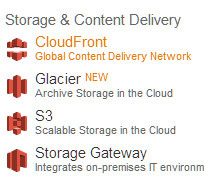 Setting up Amazon CloudFront as your CDN Letâ€™s start with Amazon CloudFront. If you havenâ€™t done already, signup for Amazon Web Services and login to your account. When logged in, you should do a separate signup for S3 and CloudFront. Now head back to your WordPress installation, open the â€œGeneralâ€� section of W3 Total Cache, and where you first selected â€œSelf-hostedâ€�, now choose â€œAmazon CloudFrontâ€� under â€œOrigin Pullâ€� (this means the CDN will extract the necessary files from your site). Click â€œSave all settingsâ€�. Open the CDN section again, and scroll to â€œConfigurationâ€�. Fill in your â€œAccess key IDâ€� and â€œSecret keyâ€�. 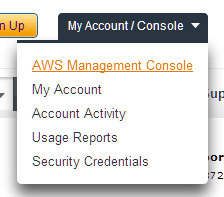 These keys can be find in â€œMy Accountâ€� in the Amazon AWS portal, and then select â€œSecurity Credentialsâ€�. 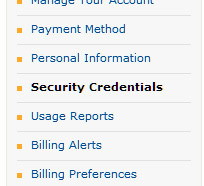 In the â€œAccess Credentialsâ€�, you will find your â€œAccess Key IDâ€� and (after you click â€œShowâ€�) your â€œSecret Access Keyâ€�. Now copy these into your WordPress CDN configuration. Wait till your CloudFront distribution is deployed, which can be verified in the AWS Management Console at Amazon, in the CloudFront section. While â€œInProgressâ€� you will have to wait. Once you see this, youâ€™re good to go. To make sure, use the â€œTest CloudFront distributionâ€� button to test. Your files are automatically pulled into the CloudFront CDN (this happens when your distribution is â€œInProgressâ€�). After the distribution is “InProgress”, import your attachments into the media library. Thereâ€™s a button on top of the CDN section to do this, called â€œImporting attachments into the Media Libraryâ€�. Press this, and click â€œStartâ€� in the pop-up that follows. After uploading is done, close it and save configuration. This is an header image, loaded from CloudFront. With W3 Total Cache you can also choose for Rackspace Cloud Files, with Akamai as your CDN provider. First, make sure you have a Rackspace Cloud account. After that, in the â€œGeneralâ€� section of W3 Total Cache, scroll to the CDN configuration, and select â€œRackspace Cloud Filesâ€� as CDN Type. You can only choose for â€œOrigin pushâ€�, which means you have to upload the files yourself (the plugin helps you in this). Go to the CDN section, and scroll to the configuration. Fill in your Rackspace Cloud username (which you choose when signing up). Insert your API key. You can retrieve this by logging in at Rackspace.com into â€œThe Rackspace Open Cloudâ€�, and selecting â€œAPI keysâ€� after logging in. If you havenâ€™t got an API key already, make a new one. Click on â€œShow Keyâ€�, and copy it. 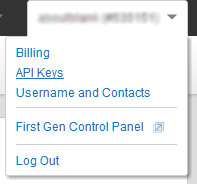 Now go back to your WordPress installation, and insert the API key into your CDN configuration API key field. Keep the location to â€œUSâ€� (you can change this to UK, but it doesnâ€™t matter). To be sure, click on â€œTest Cloud Files upload, and make sure you pass the test. Hit the â€œSave all settings buttonâ€�. Now scroll to the top, and you see a whole bunch of notices. You basically have to click them all, starting with â€œExport the media libraryâ€�, than uploading all your files, and empty both the page cache and minify cache. You can also always login into your â€œFilesâ€� at your Rackspace Cloud account, and open your container. 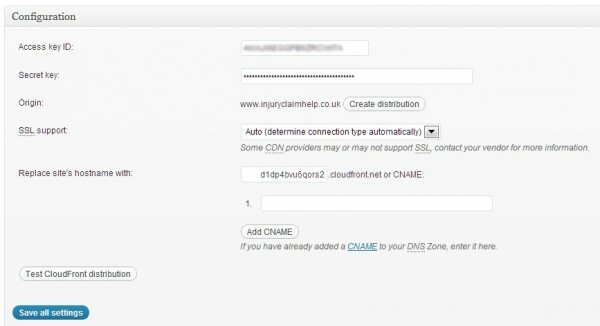 As you can see, setting up a CDN for your WordPress blog is fairly simple. W3 Total Cache makes it very easy and fast, and as a result your site can load much faster.